When it’s time to replace your garage door, American Garage Door has been the company to call since 1974. We perform all garage door services including door adjustments, lubricating hinges and rollers, tightening and more. We specialize in the service, installation and repair of garage door and garage door openers as well as custom wood garage doors and more. 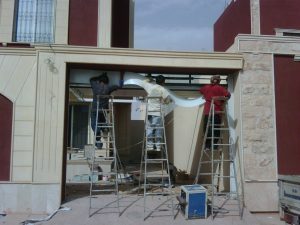 When our technicians replace your garage door we will ensure that you are completely satisfied with our work. We guarantee all parts and service of those parts for one year. Whether you have new construction or your need to replace your existing garage door, Customer satisfaction is a large part of our longevity in this industry. As a leader in garage door sales and service and repair, give us a call today.